The overall goal of my research program is to better understand the pharmacology and organization of neural circuits that produce and modulate rhythmic behavior in organisms. My current research focuses mainly on the meuromodulators and receptors that control the feeding behavior of the pond snails, Helisoma trivolvis and Biomphalaria glabrata. 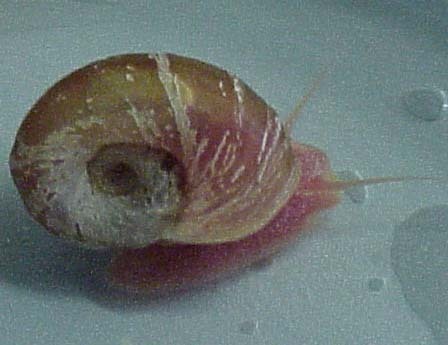 The pond snail, Helisoma trivolvis. Pond snails have a relatively simple central nervous system consisting of several ganglia (groupings of neurons) linked together in two rings. In this relatively simple nervous system neuronal activity can be correlated closely with the behaviors of the animal. Feeding behavior is characterized as a rhythmic motor activity consisting of three repeating phases. The animal protracts a toothed radula (tongue-like organ), retracts it while scraping food off the substrate, and then hyperretracts it to deposit the food into the esophagus (swallowing). Certain environmental or internal signals, however, convert the three part ingestive behavior to a two part egestive one, or turns the rhythm off entirely. Both classical neurotransmitters, such as glutamate, dopamine, GABA and serotonin, and peptide neuromodulators like neuropeptide phenylalanine (NPF) mediate the sensory signals and influence the feeding behavior of these snails. Future interests include the further characterization of the role neuropeptides and glutamate play in the neuronal network controlling feeding behavior in the snails, particularly in Biomphalaria, for which little physiological information is available. Buccal ganglion of the tropical pond snail Biomphalaria glabrata with fluorescent stain-filled motor neurons. 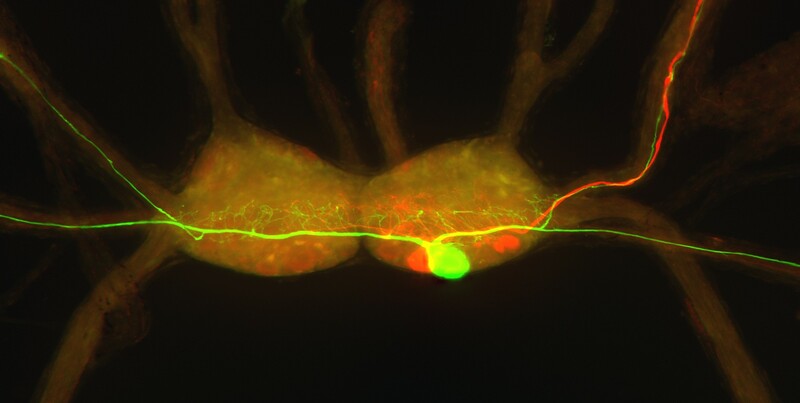 Techniques used to study the modulation of feeding behavior include simultaneous intracellular recording from more than one neuron in the relevant circuit, injection of neurons with dyes to visualize their morphology, immunocytochemistry to determine what proteins are present in the neurons, bioinformatics to find available molluscan peptide and receptor sequences, and molecular cloning of neuropeptides and receptors from pond snails.